Are you tired of getting crushed by mid-terms and assignments in the dreadful March? Want to take a break from your obligations? Lap-Chee College definitely has the solution for YOU. 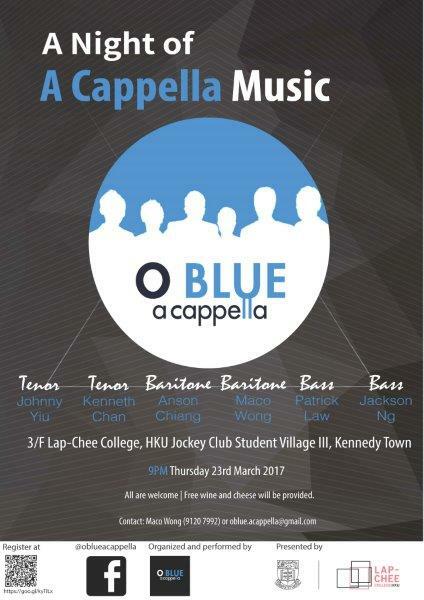 Join O’blue A Cappella for an evening of A Cappella music! O’blue will sing in various styles and they sure are here to impress. Whether you are a classical lover, or a simple music appreciator, this is going to be a great night for you. Register at the link below and enjoy a wonderful Thursday night with us. All students are welcome. Wine and cheese will be provided. O’blue is an A Cappella group formed in 2013 when its members were still high school choir boys. Essentially structured as a traditional barbershop quartet with a fifth member providing percussion sounds, O’blue has developed its repertoire and expanded into a multi-genre A Cappella show group. O’blue has performed in different occasions such as Sedan Chair Charities Fundraising, various mall functions, wedding banquets, etc. It held its public concert in 2014 and was highly accredited for its performance.